Why are there no new banks? In the boom years leading up to the Great Recession, about 100 startup banks popped up across the nation each year. But since 2009 there have been no new startup banks — known in the banking industry as de novos — chartered in Virginia. And it’s been virtually the same story nationwide, with only 11 new banks opening in the U.S. during the past decade. That may be about to change, however. Jelena McWilliams, chairwoman of the Federal Deposit Insurance Corp., said in a Dec. 6 statement that the FDIC would streamline the application process and announce initiatives to encourage the formation of more new banks. In an article she wrote for American Banker magazine in December, McWilliams discussed the need for small community banks, pointing out that the top 10 banking companies now hold more than 51 percent of industry assets and that about 25 percent of U.S. counties are served by only one community bank or bank branch. As the economy strengthened in recent years, the FDIC took some small steps to encourage de novos, such as decreasing — from seven to three years — the time that startup banks are required to adhere to their original business plans. In November, North Carolina regulators approved the formation of American Bank & Trust, the first new bank in the state since 2008. And banking sources say that Virginia also may soon see its first new chartered bank in a decade. VisionBank is a proposed community bank that would serve the Washington, D.C., area. The bank is being formed by Mindi McClure, a founding director of the Bank of Georgetown (which was acquired by Charleston, W. Va.-based United Bank), and Richard Horn, a founding director and general counsel for WashingtonFirst Bank (acquired by Sandy Spring Bank in Maryland). Neither McClure nor Horn responded to interview requests for this article. Before the 2008 financial crisis, many new banks formed with the intention of being acquired by larger financial institutions, says John Asbury, the president and CEO of Richmond-based Union Bankshares. These startup banks “funded themselves in a high-risk manner,” he explains, offering very high rates for deposits and engaging in risky lending in order to grow and become profitable quickly. But after the economic downturn, the de novos that weren’t acquired couldn’t survive amid rapidly escalating costs of doing business. After the Dodd–Frank Wall Street Reform and Consumer Protection Act was passed in 2010, significantly increasing regulatory burdens and the cost of compliance, smaller banks merged or were absorbed by larger banks to achieve the greater scale needed to compete in the new environment. And that’s not to mention the massive expenses associated with investments in technology and cybersecurity that banks must now shoulder in order to remain safe and competitive, Asbury says. “It’s a very challenging environment for any small bank, particularly a startup bank that has no real revenue stream or revenue base,” he says. Consequently, for small banks with less than $500 million in deposits, Asbury adds, “there are more sellers than buyers” these days. While there are groups raising capital for a small number of startup banks, sources say it’s doubtful the nation will ever see a return to the pre-2008 days when new banks continually cropped up in the wake of a seemingly never-ending wave of acquisitions. After all, even with the absence of the de novos, the banking landscape continued to become more competitive during the last decade, Asbury says, with national banks growing increasingly larger and credit unions becoming de facto banks. There is also the fairly recent rise of industry-disrupting “neo banks” — small, online-only banks such as Chime, Aspiration and Empower aiming to take on bricks-and-mortar banks by offering fee-free checking accounts. Here in Virginia, “we have a fairly healthy, competitive community-bank community right now, [with] well-run local banks expanding their footprints, and that makes it difficult for a new bank to enter,” says Steven Yeakel, president and CEO of the Virginia Association of Community Banks. Because of those capital requirements and the need for large numbers of customers, it’s more likely that new Virginia banks will form in high-population centers such as Northern Virginia than in underserved rural areas, says Bruce Whitehurst, president and CEO of the Virginia Bankers Association. 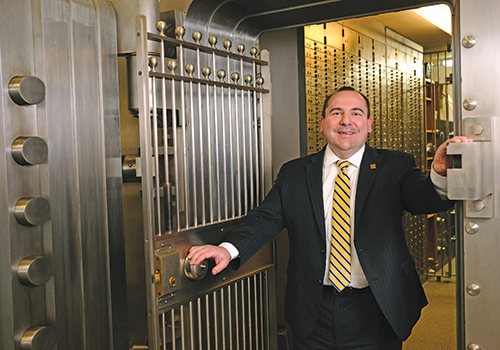 John Jordan, executive director of the Graduate School of Banking at Louisiana State University, started and ran a small-town community bank in Tennessee in the late 1990s. While Jordan applauds McWilliams’ intention to spark the formation of new small community banks, he says that won’t happen without action from Congress to reform banking regulations significantly. Without reducing compliance costs and leveling the playing field, he says, small de novo banks won’t be able to afford to form in the communities where they’re most needed. Asbury with Union Bankshares thinks that, while some new banks might emerge to serve underserved rural markets, the economics involved in that effort will be very challenging. It’s more likely, he says, that the new class of de novos will target niche businesses and will be built around new and emerging technologies. Whitehurst agrees, saying it’s probable that newer bank startups will rely more on online banking services than physical branches.